Ken in 1973 at 30, just after starting the walk. 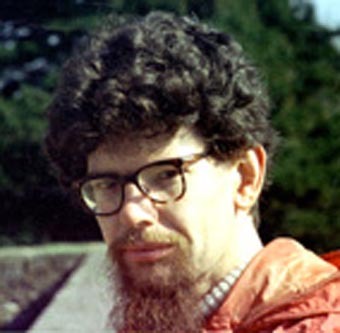 Ken in 1995 at 52, just before completing the original walk. This was not originally an objective but when my Father died in 1993, it occurred to me that I should get some things finished. By that time, I had done about 60% of the trip in bits and pieces over the years and only three more trips were needed to complete it. It took 22 years to do 22 days walking but some of those were half days and it would take four weeks to reproduce it, with a sensible scattering of rest days. It is not Kev Reynolds 'Alpine Passes Tour' although it co-incides in many places, nor is it necessarily the 'best' tour. This account is made up of slightly edited diary entries and excerpts from notes from before I kept a diary. I have included notes of other parts of the individual trips in italics to show the context of the stages in the tour. Most of it was done alone and I have indicated where I was accompanied. But every inch was on foot. Since completing the tour and before in some cases, I have done some alternatives, which were originally included as appendices. However, I have now included them in context to make this more guide-book-like. July 2nd 2001 - Two of the sections were done in the 'wrong' direction, West to East. In June 2001, I corrected this anomaly & also improved the 16th section from Grindelwald to Wengen. If you have hit this site before then, you will now find many improvements. In September 2005, I did a trip to add two new alternatives in the Western Bernese Oberland & to add many more route photos to this site,hoping this will be helpful. In September 2009, I added the start from the far North-Easterly corner of Switzerland, which is a hill called the Grübelekopf & just next to it (West) is a pass from the Visnitztal, which comes up from Kappl in the Austrian Paznauntal. An alternative start from Ischgl was included in July 2011. 'wrong way' sections & takes the easier options. Hint. Only go as far as Wengen & enjoy the views. way, before two unavoidable toughies in succession. It is the same from now on. The bold line is the frontier & the thinner line, the original walk. To make it more useful, I have included the numbers of the Swiss National Survey 1:50,000 maps for each days walk as 'LKxxx' for Landeskarte and the map number. I have also added maps to every page but taken from the Official Map of the Automobil-Club der Schweiz, (with their permission) which is on this link. Heights are included in the form '1234m' where 'm' is metres above sea level. Some of the photos have the route marked, using the Bill Poucher convention of dashes for the visible bits but dots for the bits behind the hill are not always practical on the scale of a web page. URL: http://www.art-science.com/Ken/Alpine/XSwiss/index.html Last revised 13/7/2011 © 1998-2011 Ken Baldry. All rights reserved.